For modelling in relief using clay or plasticine, a rectangular wooden board is used as a base on which to create a model of the image. The estimated dimensions of the relief are first drawn onto the board as a guide; small pieces of plasticine are next laid down in the centre of the estimated space which the relief will occupy on the board. More pieces are then added to the initial clump by spiralling outwards towards the boundaries, smoothing the surface and connecting the plasticine pieces together soundly, in the process. An outline of the composition is then scribed onto the smooth surface of the plasticine foundation. Roughing in, verification and revision of the proportions now ensues; and a simultaneous working out of the relative heights i.e. levels within the form. Details come later. The relationships between the planes are now improved upon, and also more attention is paid to the relationship between the positive and negative space. The image/form has to be simplified and abstracted. Experimentation with a range of tools to manipulate the plasticine takes place. These may be a diverse collection of domestic, handmade and industrial implements, modified by the artist according to need. Next, buttressed walls of plasticine are installed around the model in order to contain the silicone mould. To make a silicone rubber mould, silicone and a catalyst are combined immediately prior to use. This mix is then poured over the model in an even layer starting from the centre, and the process is repeated. Once the silicone has set the plasticine walls are removed, and the silicone mould is gently released from the plasticine model. 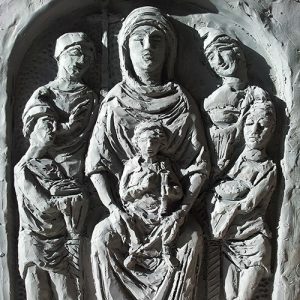 The mould is then ready to use to create a plaster cast or to make a wax positive, which can be cast in bronze. To make a wax positive from the silicone mould (i.e. for purposes of casting the work in bronze), special green wax is heated in a pan, before being applied to the mould using a hog brush and working very quickly, building up the thickness layer by layer, and concentrating on the high parts. After the wax has cooled the positive is gently removed from the flexible mould. Finally this is taken to a bronze foundry for casting. To model a sculpture in the round the process is similar to relief, except that it is created on a board where a floor plan has been outlined. The figure then takes shape – with the artist working upwards and outwards, and all the while constantly turning the piece, so that it can be worked from all directions. 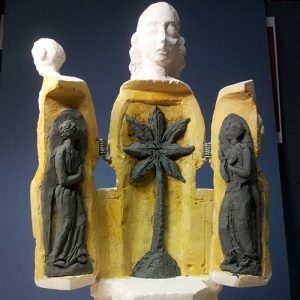 To make a three dimensional mould the model must be cast in plaster in separate pieces which are joined together later, using techniques to ensure correct alignment of the parts. The negative casts are joined together temporarily, and heated wax is poured into the hollow figure to create the positive form; the wax figure is then released from its casing by separating the individual casts which form the figure in the round. The wax figure, will be ‘lost’ once it is replaced by molten bronze at the foundry. 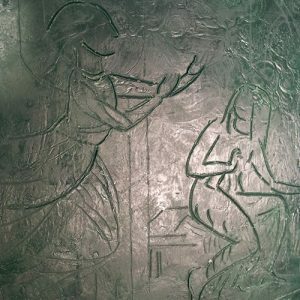 A process of finishing, smoothing and refining the bronze then takes place, after which it is usual to ‘patinate’, or colour the metal sculpture, applying recipes whose ingredients include corrosive acids, according to the effect required.